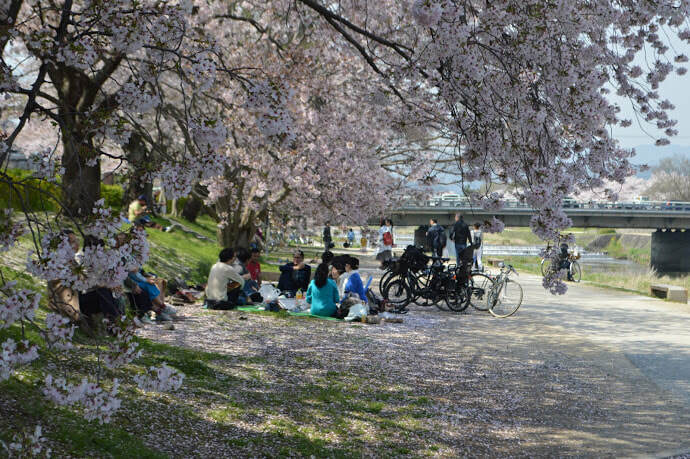 Thanks for booking the Cherry Blossom Bike Tour of Kyoto. You are visiting Japan during the magical time of year when the cherry blossoms are expected to be in bloom. In fact the forecast this year is for the first flowers to start to show Mar. 25th in Kyoto with "full bloom" happening April 2nd. Even if you miss the peak days, they are usually with us until the 10th or so with them falling like snow from the sky. We may change the course a bit based on crowds and flowering times but please note that mother nature being what it is we never know for sure if you will see the perfect blossoms. That is why the Zen buddhists value them so. On this tour we cover about 16km in the morning and 13km in the afternoon so it's almost 30km by the time it's all said and done. Luckily Kyoto is quite flat so it's not so challenging but make sure you have a big breakfast (or lunch) before we meet if doing the half day and a nice lunch during the lunch break to get your energy up if you are doing the full course. You might not want to have anything planned that evening except a chill evening or a hot bath! Let us know if you want to change your booking from full day to half day more than a week in advance and we can change it free of charge. Please try to arrive on time for the tours and even a little early. The bike rental staff might even be able to help you get suited up even if your guide has yet to arrive. We are expecting up to ten people per tour so the faster we can get going the better. In the case of rain, we will continue to have the tour on foot. Just bring an umbrella and take a taxi to the first stop (details will be emailed) and get the receipt and we will cover your fare up to 3000 yen. If you are keen to cancel because of rain and skip the walking tour we will refund 50% of your booking fee. Due to heavy congestion and the different blooming times of the cherry trees we may need to make changes to the course we take. You guide will do their best to show you a great time and hopefully see everything we set out to see. Just one block and a half north of Shichijo street on Karasuma Street and across from the huge and impressive Higashi Honganji Temple we will meet at Miyabiya Rent-a-Bike for the tour. Just 9mins walk North from Kyoto Station. 8:25am for Half Day AM or Full Day Tour. ​Note that we will try to get going as quickly as possible but we may need your help by doing your best to come on time and prepared. If coming by taxi, request to be dropped off at Higashi Honganji Temple and walk across the street and a little North to the rental shop. Thanks for confirming that you have read all the information. Also thanks for answering the questions below and signing the waiver form. Looking forward to welcoming you to Kyoto! Standard bike is fine. Might be interested. Yes I'd love to. By signing this document I declare that Kyoto Fun, the rental bike company used on the day of the tour and my all individuals associated with those organisations will not be held responsible for any accidents or injuries including those that could result in life long disability or even fatality. If deciding to ride without a helmet I also realise that I do this at my own risk. Your safety is our number one priority and we need your help to let us know if at any time you feel uncomfortable on the bicycle. Your guide retains the right to stop the tour at any time if he or she feels someone’s safety is at risk. Conditions are always changing on the road so while we want you to follow your guide when you can, always rely on your own instincts and common sense for your own safety. To date we have had just a couple of scratched knees and one broken phone. Please ask your guide to stop if you want to operate a phone or camera for your own safety and that of your device.